Joanna Hall – a leading independent fitness expert – created 'Walkactive' in 2008, hailing it as a revolutionary walking technique that could stimulate radical changes in body shape, posture, and health. 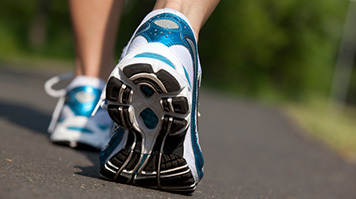 The Walkactive technique encourages participants to walk through the whole of the foot while attending to specific mechanical considerations within the gait cycle, including: hip stabilisation, retracted shoulders and correct use of the arms - all of which have been suggested to improve health and wellbeing by improving posture and promoting weight loss. To verify these anecdotal benefits, Joanna Hall approached Dr Darren James of LSBU's Sport & Exercise Science Research Centre (SESRC). The research centre is internationally recognised for its expertise in movement neuroscience, muscle metabolism and clinical and applied science. Joanna Hall said: "Since creating my Walkactive technique and seeing our clients improvements in their posture, body shape and joint discomfort. I have always wanted to have some scientific verification into the merits the system. "The research centre at London South Bank University is internationally recognised but I was also particularly keen to work with the team there - led by Dr Darren James - due to his specialist research interest in walking. Walking is the most accessible form of exercise for the vast majority of people so to have the Walkactive technique examined in terms of its health and benefits by a team who specialise in walking has been very exciting." In December 2013, Telegraph readers were invited to take part in a scientific study at LSBU that aimed to demonstrate the effects of the Walkactive technique. From thousands of submissions, 24 participants, whose only physical activity amounted to leisurely walking, were chosen to follow a 28-day Walkactive plan. Their responses would be compared with a control group of 10 people who were matched for baseline physical activity, and received no training and were asked not to alter their lifestyle. Dr Darren James explained: "The results of the study showed that walking speed increased in the Walkactive group by 23%. All of these participants reported that their level of physical activity had increased since taking part in the study, whereas none of the control group reported this. 96% of Walkactive participants reported that their general wellbeing had improved since starting the study, as opposed to 0% in the control group." As a result of the 28-day plan, significant reductions were found in body mass (2%), estimated body fat percentage (3%), and in the skinfold measurement at the waist (15%). Participants walked taller following the 28-day plan: their centre of mass vertical displacement was significantly greater than pre-intervention measurements as a result of improved posture and skeletal alignment. Correspondingly, ground forces during the single-limb support phase of walking were significantly lower, causing noticeable reductions in the force experienced at the knee and ankle joints. Over the weekend of 7-8 June 2014 The Telegraph will publish the results of the study, with an accompanying 28-page guide encouraging its readers to follow the plan and achieve similar positive results.